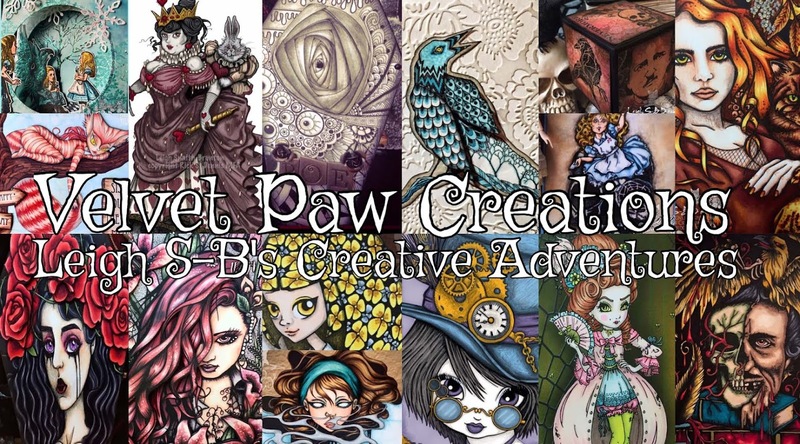 Velvet Paw Creations: "Twilight Serenade" - Introducing the New "Proud As A Peacock" Stamp Set by Blockheads Paper Arts! 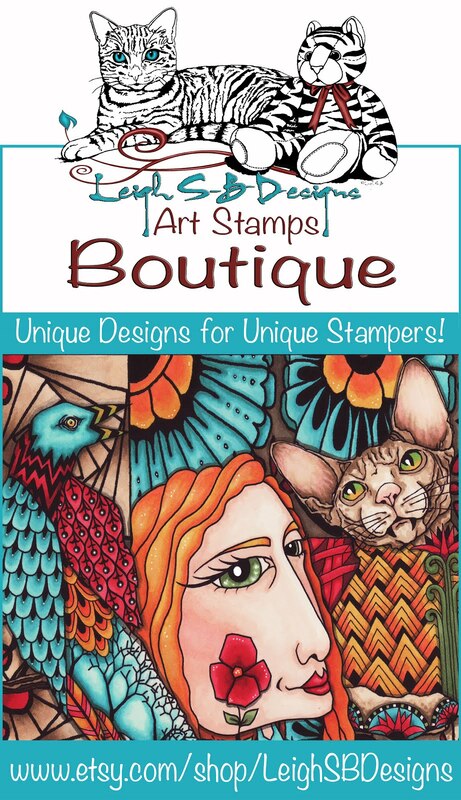 "Twilight Serenade" - Introducing the New "Proud As A Peacock" Stamp Set by Blockheads Paper Arts! 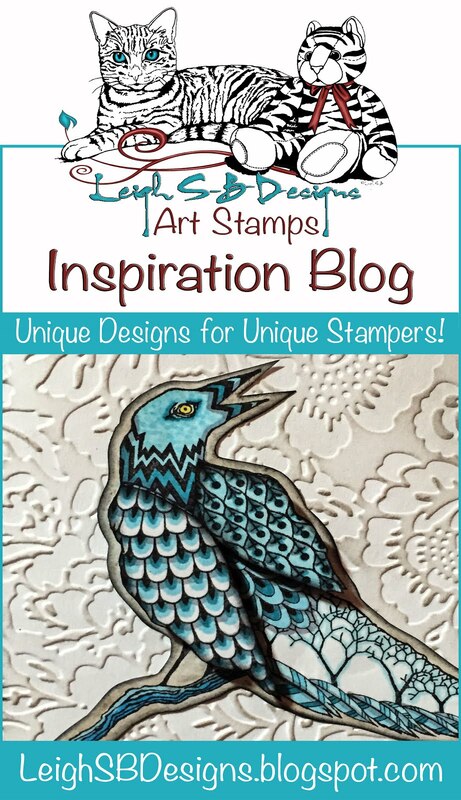 I'm thrilled to be showcasing Blockheads Paper Arts newest stamp set release called Proud As A Peacock! 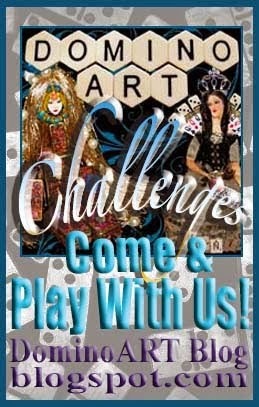 These images are divine and I've been having a great time playing with them! I've got a couple of projects to share demonstrating the versatility of this set so stay tuned! 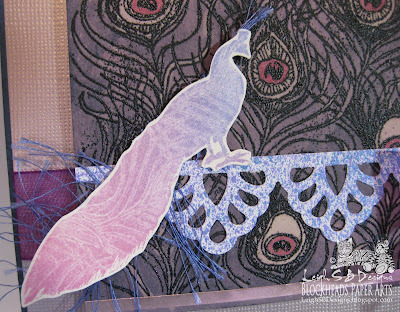 Stamp the large peacock feather background onto a rectangle panel of blue cardstock with Versamark Watermark ink and emboss the design with black embossing powder. Apply standard household bleach to the entire panel. Vary the amount of bleach used to achieve the different shades of purple and pink. Once dry apply more bleach to the centers of the feathers to get the lightest pink. Test your blue cardstocks from different manufacturers until you find the one that bleaches to the colour you like. I got mine in a big value pack at Michaels years ago so I'm going to be really bummed when I run out! I didn't get the whole background onto the panel and ended up with the plain stripe at the bottom which I decided to incorporate into my design. 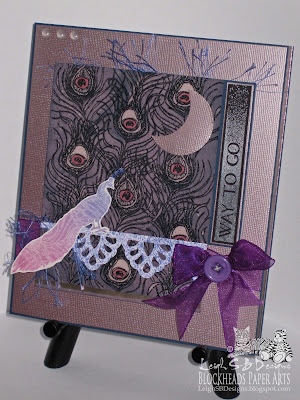 Colour the centers of the feathers with a metallic pink marker. 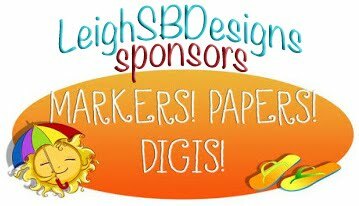 I picked up a nice set of metallic markers with really pointy brush tips by Papermania Docrafts while I was in England. Adhere a narrow metallic pink Mrs Grossman's border sticker along the bottom edge. 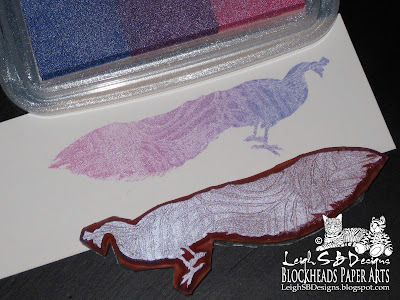 Apply Brilliance Pearlescent Twilight tri-colour ink to the Peacock image - perfect name for my project don't you think ;0) But before stamping the image onto a small piece of white cardstock press the stamp down onto the large un-inked feather background stamp to remove some of the ink. 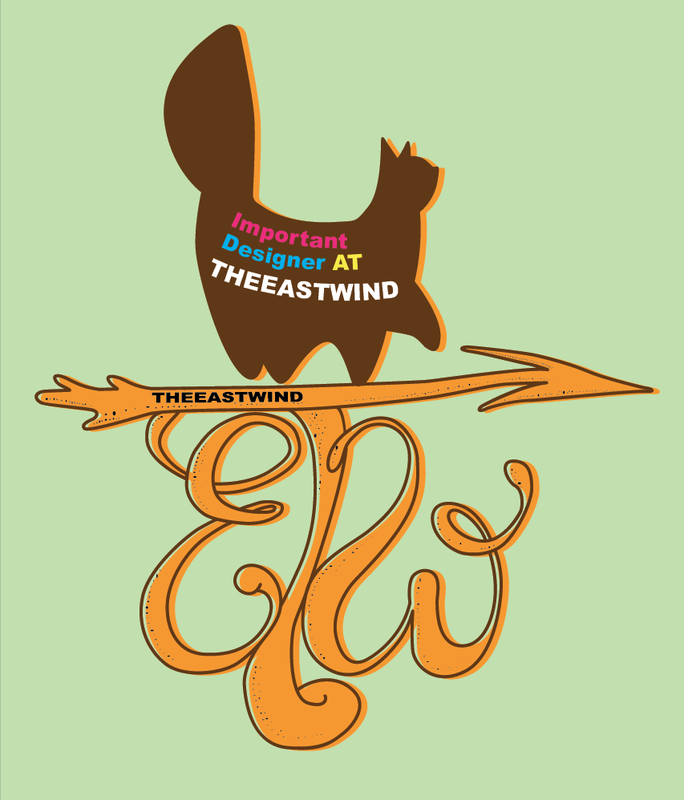 The un-inked background stamp lifts the ink away leaving a subtle design behind. Cut out the peacock and adhere a strand of purple pearlescent eyelash fiber to the back with white glue concentrating a tuft at the top of the Peacock's head and the rest around the tail. 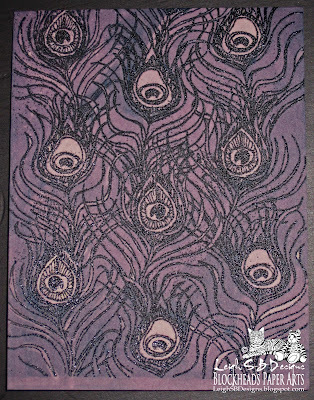 Randomly spritz another piece of white cardstock with Fireworks Craft Ink sprays (I used Danube Blue and Grape Jelly) and let dry before die cutting out the balustrade with a Spellbinders Moroccan Accents edge die. Adhere the balustrade to the background panel and then the Peacock with dabs of white craft glue. 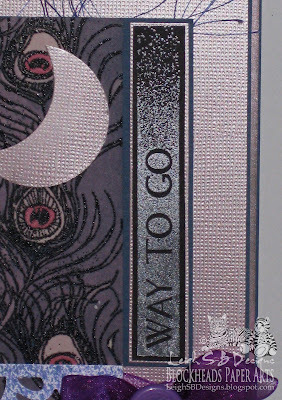 Stamp the sentiment 'Way To Go' with the same Brilliance ink pad onto a piece of black cardstock. You can't tell in the photo but it does have a subtle purple-pink hint of colour to it. Heat set the ink and cut it out with scissors leaving a narrow black border. Adhere it to a piece of metallic pink cardstock (DCWV) with double-sided tape and trim. 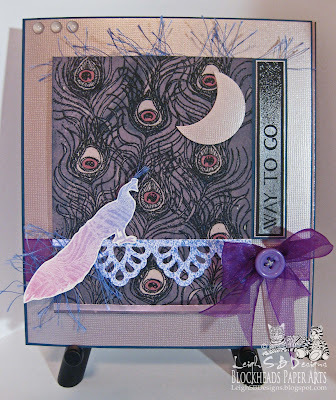 Make a tab from a piece of the same blue cardstock used for the feather background but this time only closely trim around 3 sides leaving a larger section on the left side. 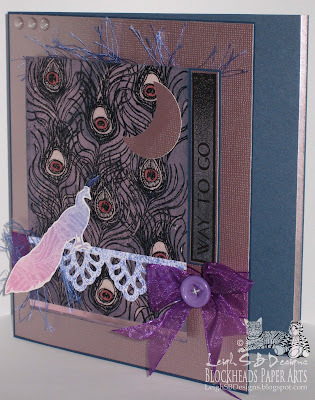 Adhere the sentiment tab to the feather background panel with double sided tape. Adhere a strand of purple eyelash fiber to the back of the feather panel along the top edge with double sided tape. Cut a large mat from the same metallic pink cardstock and adhere a piece of purple organza ribbon to it by wrapping the ends around to the back and securing in place with double sided tape. Adhere the feather panel to the metallic pink mat with pop dots. 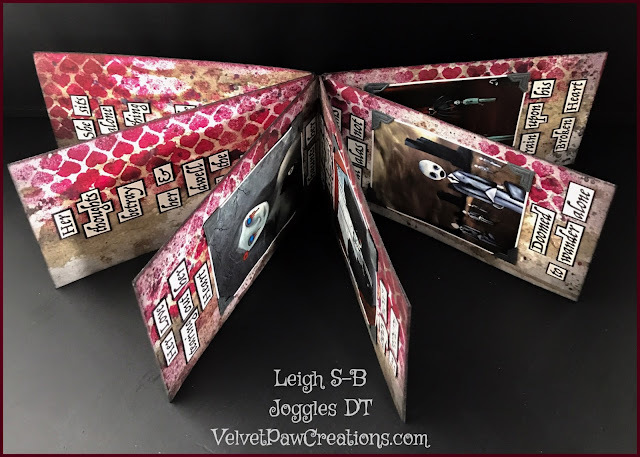 Make a card from the same blue cardstock just slightly larger than the metallic pink panel but leave the back of the card (right hand side) slightly bigger and adhere everything to it with double sided tape. Add a strip of the metallic pink border sticker along the right hand side edge on the inside of the the card so that it shows when the card is closed. 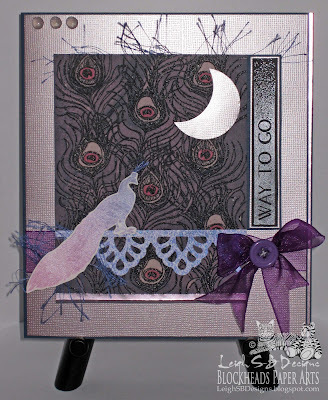 Punch out a moon from a piece metallic pink cardstock and adhere it to the background with double sided tape. 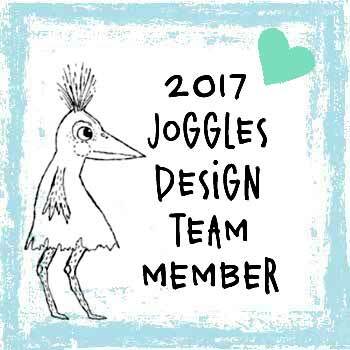 I used a circle punch and then repositioned the same punch to cut out the quarter moon shape. Make a bow from the same purple ribbon and sew a pearlescent purple button onto it with metallic silver thread. I didn't have any silver thread handy so I just ran a strand of white thread across my silver Brilliance ink pad to stain it ;0) Adhere the bow to the card with a glue dot. Finish off by embellishing the upper left corner with three pearls. I made my own pearls with a Magic Transparent White Pearl Pen so that they'd take on the colour of the pink background when they dried semi-transparent and they also have a pearlescent shimmer to them too. I took the photo below so you can see how shimmery and pretty all the elements of the card really are depending on how the light hits the card! 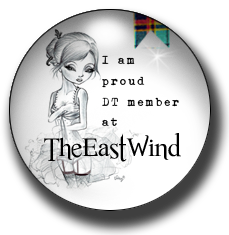 Thanks for visiting with me today! Don't forget to keep an eye out for more of my Peacock themed projects! The Blockheads Design Team are celebrating the launch with a series of 'different points of view' on what you can do with this set and the results are spectacular! 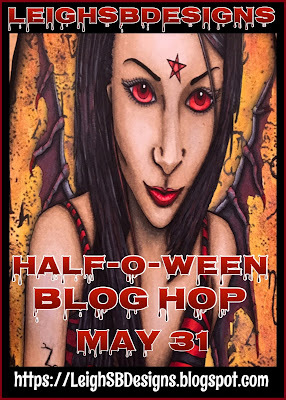 Check out Karen's collection here and Colleen's projects #1 and #2! Great bleach technique. I love the variation of colors you got from the navy cardstock. Really pretty overall card. Love the imagery! I really like how you did the stamp "kissing" on the bird. Fab!! Gorgeous, gorgeous, Leigh! I like the "kissed" bird - GREAT idea. And the bleaching was also a very clever take on that first card. 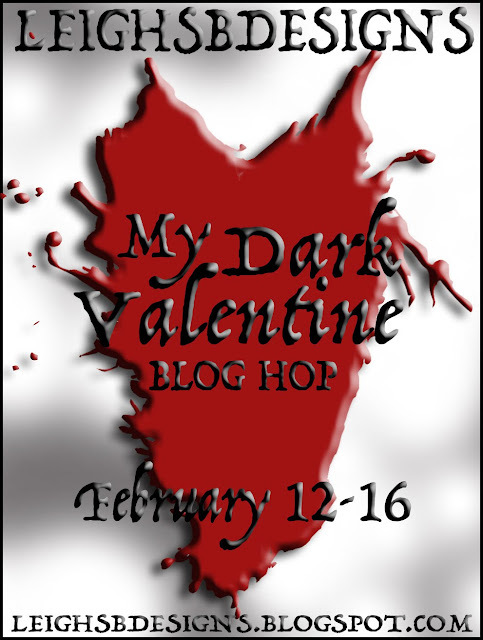 Your creativity was pouring forth! Very pretty, love the colours! "Proud Of You" Art Deco Accordion Card!